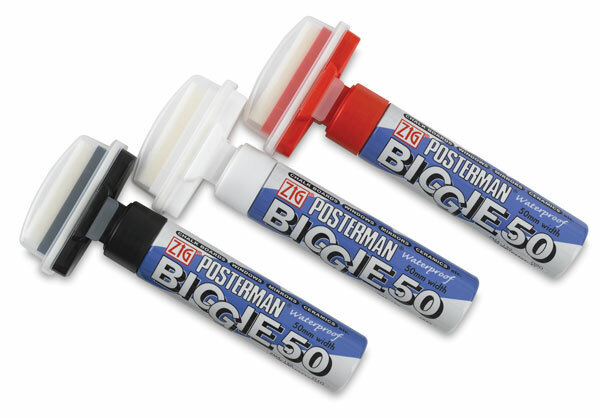 Wide tips on Posterman Biggie Markers make filling in large areas of color quick and easy! The Biggie 30 markers have a 3 cm wide tip (a little over 1"), and the Biggie 50 markers have a huge 5 cm wide tip (approximately 2"). They work great for sign making, rubber stamping, arts and crafts, window decorating, and posters. Posterman Biggie Markers contain waterbased pigment ink that is permanent, opaque, odorless, lightfast, xylene free, and non-blotting. They write on almost any surface, including paper, slate, rubber, glass, plastic, ceramics, vinyl, and metal. Biggie markers wipe off easily from most non-porous surfaces with glass cleaner. Markers are non-refillable. Biggie 50 Set of 3 — This set includes one each of Black, White, and Red Biggie 50 markers.